A.M. Goldstein, Baylor football, Baylor Stadium, Baylor Stadium Corporation, Baylor University, Connally Air Force Base, Dave Campbell, Floyd Casey Stadium, Gordon Rountree, Harlon M. Fentress, Jack Kultgen, Municipal Stadium, photographic negatives, Photographs, W.R. White, Waco, Walter G. Lacy Jr.
Every good Baylor Bear is abuzz with excitement about the new Baylor Stadium. The first time in more than 75 years that Baylor Football will play on campus! A new boat harbor and footbridge along the beautiful Brazos River! Baylor is partnering with the City of Waco to make a wonderful new event space for the entire community to enjoy. The turnout was huge for this Baylor vs. Texas A&M game in 1950. Notice towards the bottom of the image that cars are parked along Dutton Avenue to Highway 6 (now South Valley Mills Dr.). The hard work of the Baylor Stadium Corporation turned what was an empty field a year earlier into a bustling, modern sports facility. Photo by Jimmie Willis and digitally scanned from the original 4×5 photo negative. But what do you know about the last time Baylor and Waco teamed up to build a football stadium for the Bears? That story begins around 1936, when Baylor Football’s home turf was Municipal Stadium, located at 15th and Dutton Avenue. With a maximum seating of 20,000, it didn’t take long for the Baylor Football program to outgrow this facility. This picture was intended to highlight the aging Municipal Stadium in 1949 that both Baylor Football and Waco High School shared. This facility could no longer hold the crowds that Baylor football games were drawing. Photo by Jimmie Willis and digitally scanned from the original 4×5 photo negative. So how did they go about raising that money? The Baylor Stadium Corporation issued 30-year stadium bonds at 3% interest. If bonds of at least $100 dollars were purchased, this would count for tuition credit and prospective students would receive “entrance priority.” (This is not how fundraising works today at Baylor!) Supporters also had the option of purchasing seat options, which guaranteed a seat for all home games for 20 years after the construction of the stadium, with prices varying according to stadium seat locations. Fundraisers traveled across Texas, with exhortations from President White that “Baylor is not asking for a gift. The bonds are sound investments from a financial standpoint. The [seating] options are investments in future entertainment for sports lovers.” The rhetoric must have worked—by January 1950, $1,001,836.70 and counting worth of bonds and stadium seat options were sold. While fundraisers were out stumping, Baylor had to figure out the right location for the stadium. Their first choice was to stay in the same area as Municipal Stadium, on the grounds of the former Texas Cotton Palace. But then as now, parking was an issue, and a geological fault on the land caused construction concerns. On to Plan B—a February 1949 news release announced the purchase of a 100-acre plot in “Waco’s west suburbs” for the new Baylor Stadium. Baylor President W.R. White digs the first shovel of dirt to at the Baylor Stadium groundbreaking on May 28, 1949. (The event started at 5 pm, hence the large array of lighting.) Photo by Jimmie Willis and digitally scanned from the original 4×5 photo negative. The groundbreaking ceremony for the new Baylor Stadium was held on May 28, 1949, and construction began in November of that year. And even though the stadium wasn’t quite done yet, the Bears played their first game at Baylor Stadium on September 30, 1950, against the University of Houston. The President of the Baylor Stadium Corporation, Jack Kultgen, presented the stadium to Baylor University. The stadium’s seating capacity was 49,000 at the time and it was hailed as a “Fittin’ home for the Fightin’ Baylor Bears.” Opening ceremonies included the nearby Connally Air Force Base sending a group of planes to do a flyover of the new facility, while the University of Houston played the national anthem and the Baylor Air Force ROTC color guard raised the colors. Baylor even beat the University of Houston 34-7 on this long-awaited opening day. This may be the dedication game, Baylor v. Houston, that took place on September 30, 1950, but we are not certain. It is indeed a very early photograph of Baylor Stadium, with construction still in progress in the end zone. Additionally, tracks from construction vehicles can be seen around the field. This is a U.S. Air Force photo. The city of Waco, Baylor University, and a vast network of alumni and sports fans made this vision a reality. Baylor Stadium (which became Floyd Casey Stadium in 1989) was a true investment in the future of Baylor Football and for the Waco community, serving both for more than 60 years. The new Baylor Stadium, with the dedication and support of Baylor fans and Waco citizens alike, also will turn a lofty vision into a stunning reality. Enjoy a Flickr slideshow with more early photos of Baylor Stadium and its construction. Click the large arrow to start the show–and if you want to see the photos full-screen, click on the crosshairs that will appear in the lower right corner of the photo. 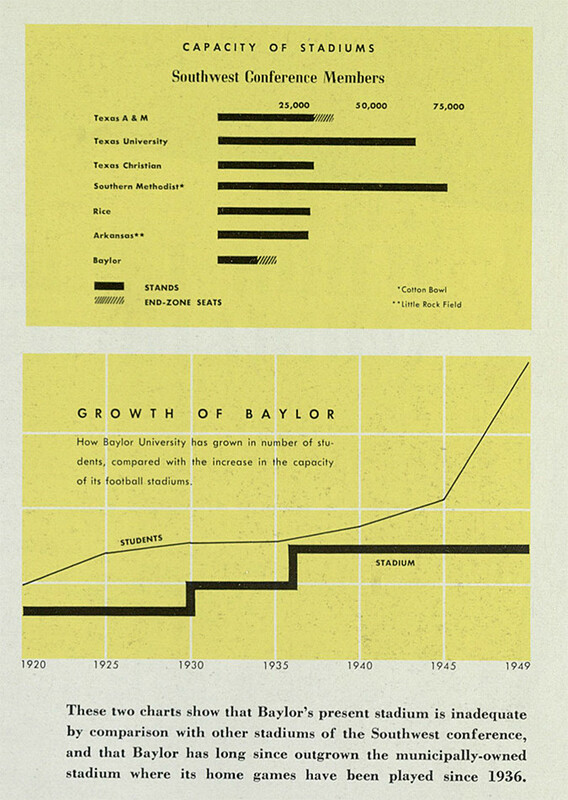 The Invisible Line (The Baylor Stadium Corporation: Waco, Texas, 1949). Baylor University Subject Files: BU Buildings: Baylor Stadium: 1948-1949. The Texas Collection, Baylor University, Waco, Texas. Waco and the Baylor Stadium Campaign: a handbook for workers and a prospectus for investors. Baylor University Subject Files: BU Buildings: Baylor Stadium: 1948-1949. The Texas Collection, Baylor University, Waco, Texas. “Carroll and Dillard Tour Texas Towns…” The Daily Lariat, November 5, 1949. “Stadium Building Committee Will Read Bids in UB Today.” The Daily Lariat, November 2, 1949. “Shiver Declares December 2 As Statewide ‘Baylor Day.’” The Daily Lariat, November 9, 1949. “Stadium Progress Is Good Despite Weather Conditions” The Daily Lariat, January 20, 1950. W.R. White Letter, March 8, 1950. Baylor University Subject Files: BU Buildings: Baylor Stadium: 1950. The Texas Collection, Baylor University, Waco, Texas. “Nash is Named To Head BU Stadium Group.” Waco Tribune-Herald, February 11, 1952. “Baylor Stadium Site Chosen,” Baylor University Newsletter. Baylor University Subject Files: BU Buildings: Baylor Stadium: 1948-1949. The Texas Collection, Baylor University, Waco, Texas. “Swigert Submits Lowest Bid for Baylor Stadium.” The Daily Lariat, November 5, 1949. “Speeches, Bands Will Dedicate Fittin’ Home for Fightin’ Bears”. The Daily Lariat, September 29, 1950. “Football Is Booming for Centex.” Waco Tribune-Herald, February 10, 1957.